Cissy 1962 Bride No. 2170, elaborately dressed in beige lace over white-pleated tulle with bracelet length sleeves, and a scalloped hemline. Spring and June Brides are universal wedding tradition. The June wedding is a very romantic tradition and a huge industry that seems to never downsize. For Cissy, being a bride was hardly and option but a necessity to navigate twentieth century culture. Career options were still pretty limited, and a wife was one of the top five choices. 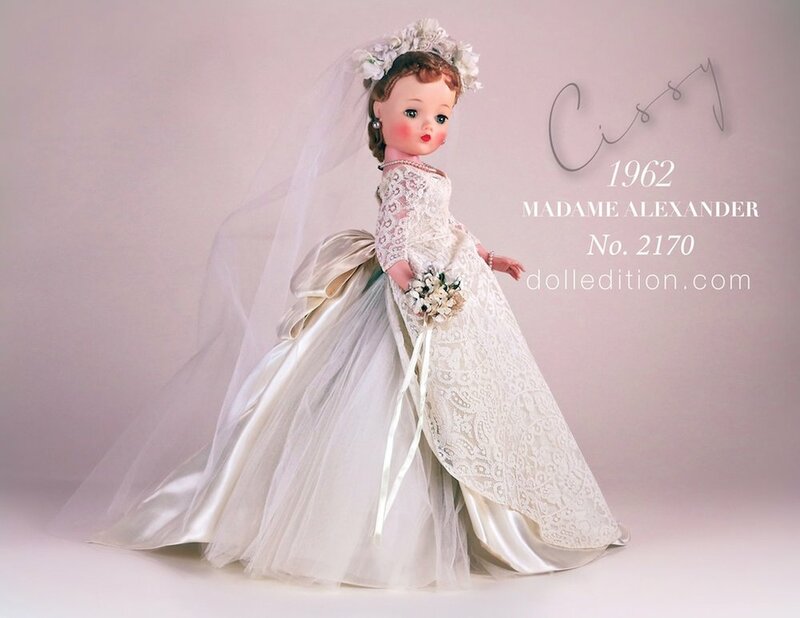 For Madame Alexander, the annual Cissy bride was always an opportunity to design with a flourish and create something magical. The fun of collecting fashion dolls is the fashion they represent from the period they were produced. The wedding costumes done for Cissy are an intriguing look at the mid-century bridal trends that found their way to Cissy. Princesses got married, movie stars got married, prom queens got married... Cissy got married from 1955-1962. Perhaps it was cold feet or maybe she became the ultimate fashion victim - regardless, she is at her most beautiful each year in her bridal gowns, and the many wonderful variations of sleeve, veil, headpiece, and train details with, yards and yards of tulle, dozens, dozens of flowers with "pearls" and "diamonds" to finish it all off. Each year, under the gown, is the surprise element of a garter... the final flourish. Cissy 1962 Bride No. 2170 with her garter and unique shoes.